After working in the music business for close to 18 years, Chef Molly Neuman has expanded her horizons to open the Simple Social Kitchen, a personal chef, catering and consulting business. A lifelong passion for cooking began at a young age when she learned to cook at home and became expert at making heart shaped cakes, spinach salads with bacon dressing, steaks with garlic pressed in them and fried chicken. 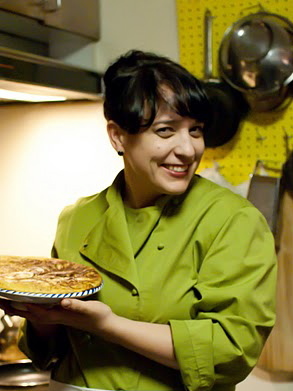 After becoming an ethical vegetarian at age 17 her relationship with food shifted towards exploring the vegetarian options in many cuisines of the world and through subsequent international travel with her band Bratmobile, had the fortune to sample many of the traditional preparations in their original countries. Through cooking at home and for friends and spending many years obsessively watching cooking shows all day on Saturdays on PBS, pursuing a career in the world of food became Molly’s new dream. She then decided to give culinary school a shot and enrolled in the Chefs Training Program at the Natural Gourmet Institute for Health And Culinary Arts. Since graduating, Molly has continued her training through apprenticeships at world renowned gourmet raw restaurant Pure Food And Wine, Michelin starred Restaurant Saul and at the James Beard House working with a variety of guest chefs including David Chang and Michelle Bernstein. She is currently completing an intensive Food Therapy course with Annemarie Colbin, PhD.